The Realme brand has made a name for itself in the smartphone industry within a short period of time. The company has launched two smartphones up till now and both are targeted at the budget segment. The Realme brand has made a name for itself in the smartphone industry within a short period of time. The company has launched two smartphones up till now and both are targeted at the budget segment. The Realme 2 has been an incredible success for the company. Realme claimed to have sold over 2 lakh units of the smartphone within five minutes during the first sale. Realme is planning to add another device to its current line-up as early as this month. The company has sent media invites for an event on September 26 and 27. 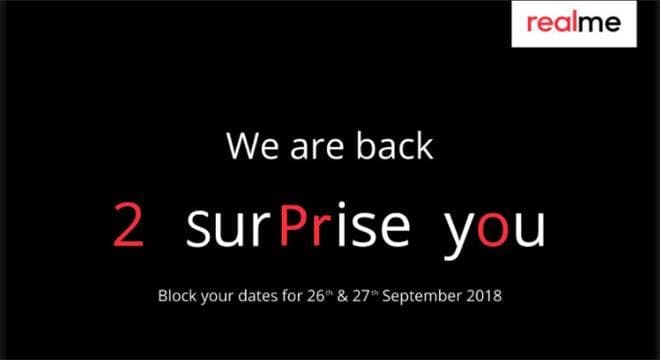 It's not clear why Realme has mentioned two separate days in the invite. The device is expected to sit above both the smartphones launched by the Oppo sub-brand. Considering the Pro moniker, the device might go against phones like Xiaomi Redmi Note 5 Pro and Asus Zenfone Max Pro M1. The company will reveal more details about the device as we get closer to the launch date. For now, its safe to assume that it will be a mid-ranger and considering the past devices, the phone should undercut the prices of other smartphones in its segment. Oppo Realme 2 went on sale for the first time on September 4 and was received well by the Indian market. The phone comes in two variants, one with 3GB RAM and 32GB of internal storage and another with 4GB RAM and 64GB of internal storage. The base variant is priced at Rs 8,990 whereas the higher variant comes with a price tag of Rs 10,990. The device comes with a 6.2-inch display with a notch on top and 19:9 aspect ratio. Realme has used an HD+ panel which could make the display look less sharp, thanks to its massive size. The Realme 2 is powered by Qualcomm's Octa-core chipset Snapdragon 450. The Realme 2 Pro might feature a chipset from the Snapdragon 600 series.